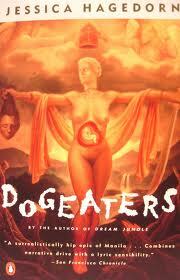 The Dogeaters by Jessica Hagedorn is, at the outset an unusual collection of stories that are all interconnected. The Dogeaters by Jessica Hagedorn is, at the outset an unusual collection of stories that are all interconnected. From the lowliest, DJ, male prostitute, junkie to the crème de la crème of society, the Alacran’s, the story of Rio follows a cyclical pattern that is almost similar to the movie Traffic. While it is true that most of the characters introduced in the novel do not intimately know each other, Hagedorn presents their lives in such vivid recreation that the reader begins to identify and understand each of the characters. Although, Hagedorn’s novel is filled with a myriad of underlying themes and subtext, it seems as though she is trying to convey the message that everyone, no matter what type of life they lead is interconnected to one another. In some respects this may be Hagedorn’s six degrees of separation. Perhaps what is most interesting about Hagedorn’s novel, however, is that in spite of the fact that it provides closure, or an ending, it still leaves the reader with a sense of loneliness. Hagedorn’s novel shows how lives of even the most unsuspecting character can be inter related; but is also show how the lives of people can be interrelated, yet these associations can go unnoticed or unacknowledged. Perhaps this is where the loneliness comes in. Rio’s life does not exist in a vacuum; nor does anyone else’s. It is our inability to realize this fact that Hagedorn shoves in our face and makes us acutely aware of. This is the point of her novel. The Awakening - Kate Chopin’s 1899 novel, The Awakening, is both complex and subtle. Barn Burning- Barn Burning Term Paper delves into a short story by William Faulkner which reflects the social conditions of the U.S. during the depression. Beloved by Morrison - Halle knows that the voice of slavery could sound kind, but still it was slavery. Black Like Me - Black Like me Term Paper explores the segregated south in the 1950′s. Catcher in the Rye – Paper Masters can overview The Catcher in the Rye, written by J.D. Salinger in 1951. Catch-22 - Catch-22 research papers on a satirical novel set during World War II, written by American author Joseph Heller. Franny and Zooey - The text, Franny and Zooey, by J.D. Salinger, is essentially two short stories or novellas, initially published separately, but since combined as a result of their close thematic elements. Grapes of Wrath - Grapes of Wrath term papers on John Steinbeck’s Classic work of American Literature. The Great Gatsby - A typical book report on the The Great Gatsby begins with Jay Gatsby meeting and falling in love with a young Daisy while he is still an impoverished officer. Green Hills of Africa - Another story that relates very directly to Hemingway’s life is that of Green Hills of Africa. The House on Mango Street - The House on Mango Street term papers overview Sandra Cisneros story of her life in one of the most famous stories in Latino Literature. If He Hollers Let Him Go - If He Hollers Let Him Go Research Paper delves into a story of a psychological exploration of the effects of racism. Lakota Woman - Lakota Woman Term Paper discusses life of a native American girl during the 1960′s and 1970′s. Paper Masters writes custom research papers on The Dogeaters and examines a book by Jessica Hagedorn, that has several stories in it that looks at how everyone is interconnected to one another.